The Anchor, Ninilchik and Kasilof Rivers, and Deep Creek are the most popular freshwater sport fisheries on the Lower Kenai Peninsula. 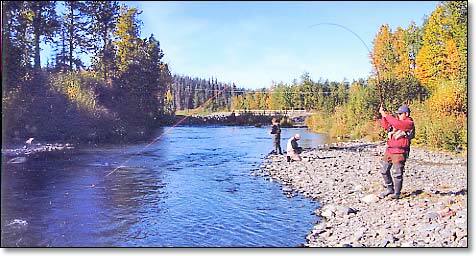 These streams provide good fishing throughout the summer and fall with runs of King, Silver and Pink Salmon, Dolly Varden Trout, and Steelhead. These rivers are narrow at only about 15-25 yards at their widest point, which makes them easy to fish from their riverbanks. All rivers are crossed by the Sterling Highway road system. The Anchor River, Deep Creek and Ninilchik River share the honor for the oldest and most traditional King Salmon fishery on the Kenai Peninsula. One of the best places to fish in Homer is the Nick Dudiak Fishing Lagoon (Homer Spit Lagoon), thanks mainly to the efforts of the Alaska Dept. of Fish and Game. This lagoon on the Homer Spit has been stocked with King and Silver Salmon, which return from the ocean every year. This provides easy access angling, with King Salmon from mid-May through June, and Silver Salmon from mid-July through mid-August. This is a terminal fishery, meaning the fish have nowhere to spawn, so anglers are allowed to take most of the fish. Each year more small fish, (smolt), are released in the lagoon, where they make their way out into the bay and ocean, growing to full size before returning one to four years later. 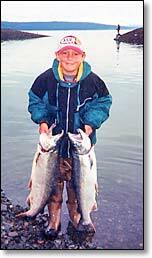 The average King Salmon is 15 lbs, with a range from 6 - 32 lbs. 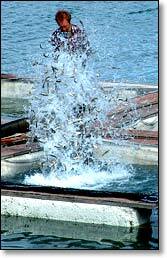 The average Silver Salmon is 7 lbs with a range from 4 -12 lbs. There were lots of people who committed crimes during the year who would not have done so if they had been fishing, and I assure you that the increase in crime is due to a lack of those qualities of mind and character which impregnate the soul of every fisherman - except those who get no bites.